Home > Settings > Coupons > How do I manage coupons? How do I manage coupons? 1. A fixed dollar ($) discount. This discount is applied as a complimentary payment to the new member balance. 2. A percentage (%) discount - This discount is set as a % discount on the member subscription and upon each delivery the coupon discount will be deducted from the subscription value. 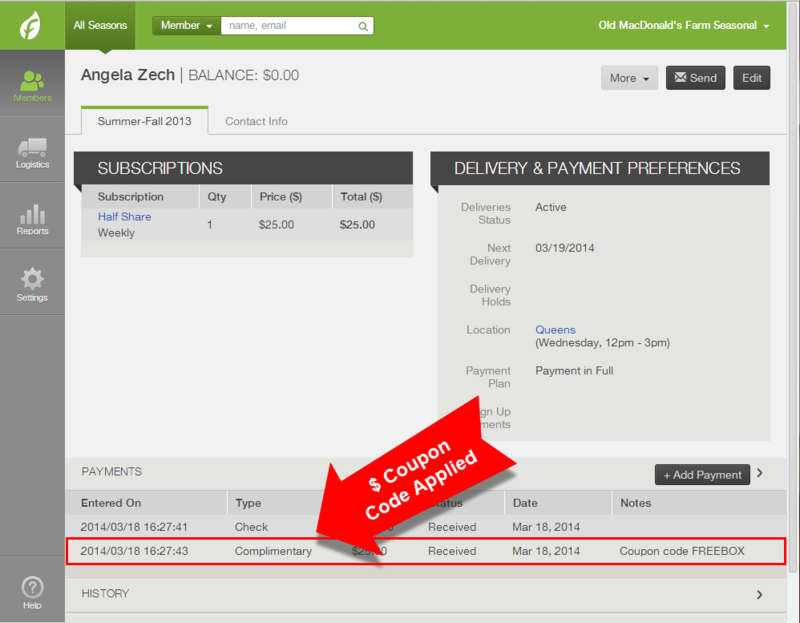 This page will help you manage subscription coupons. Click here to learn how to manage Web Store Coupons. A fixed dollar amount ($) coupon will appear as a complimentary payment. 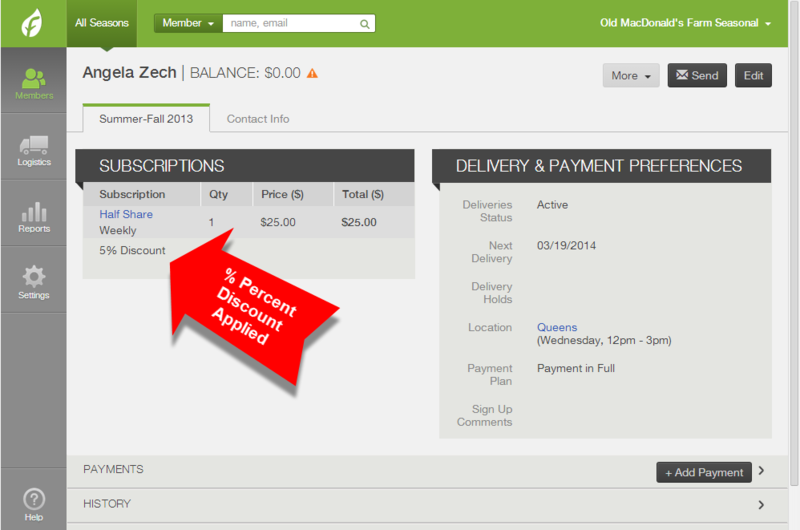 A percent discount (%) will appear next to a member's subscription. Applied as a complimentary payment to the member's account. The coupon code used can be found under the payment Notes. If you want to remove the discount, click Edit in the upper right corner of the member's account in order to see the option to remove the complimentary payment. Appears under the member's subscription. If you want to remove the discount, click Edit in the upper right corner of the member's account, change the percentage to zero, and save changes. To see which coupon code was used, check the subscriptions export (learn more below). Here you will see the total usage for each coupon. ﻿Go to the Members tab and click the button "Find Members". This action will generate a list of all of your members. Click the "Export" button and the list will be downloaded to your computer.